England were beaten 58-52 by world champions Australia in the opening game of the international tri-series at a sold out Liverpool Echo Arena. The Roses, who are third in the world rankings, secured a historic 3-0 series win over the Aussie Diamonds in their last visit to England in 2013. But the Commonwealth champions got off to the perfect start this time around. The visitors took a narrow four-point lead at half-time and England were unable to recover. The final two games of the series will be played in London on 22 and 24 January. Tracey Neville fielded a much-changed side from the team that finished third at the World Cup last summer. Australia-based trio Jo Harten, Serena Guthrie and Geva Mentor were all rested, while Pamela Cookey and Tamsin Greenway have retired. The new-look England team looked impressive in the first half against the Diamonds, but basic errors crept in and they went in 30-26 behind at the break. Australia were able to call upon 6ft 4ins shooter Caitlin Bassett - named the world's best player in 2015 - to steady the side in the second half and they saw out the game. 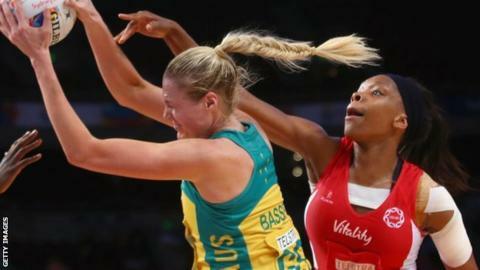 Wednesday's contest was the first international match to be played under new netball rules, which came into force at the turn of the year. Time allowed for an injury or illness time out is now just 30 seconds, meaning the injured player concerned must leave the court and may be substituted by another player. Centres must now only have one foot wholly in the centre circle before restarting play. Once the player taking a penalty pass is in the correct position, they are able to play the ball immediately - regardless of whether the offender is out of play. Umpires will no longer blow the whistle to signal goals or when a ball is clearly out of court.